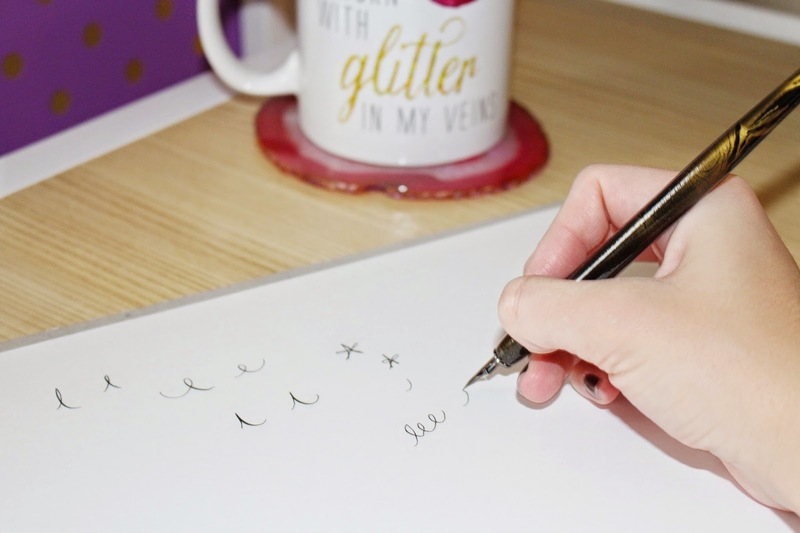 I really love all things creative and crafty…as of late, I have been obsessed with beautiful stationary, typography prints, addressed letters, etc. One day I decided, why can't I learn how to make this stuff too? Ergo, why this blog post is about learning calligraphy. 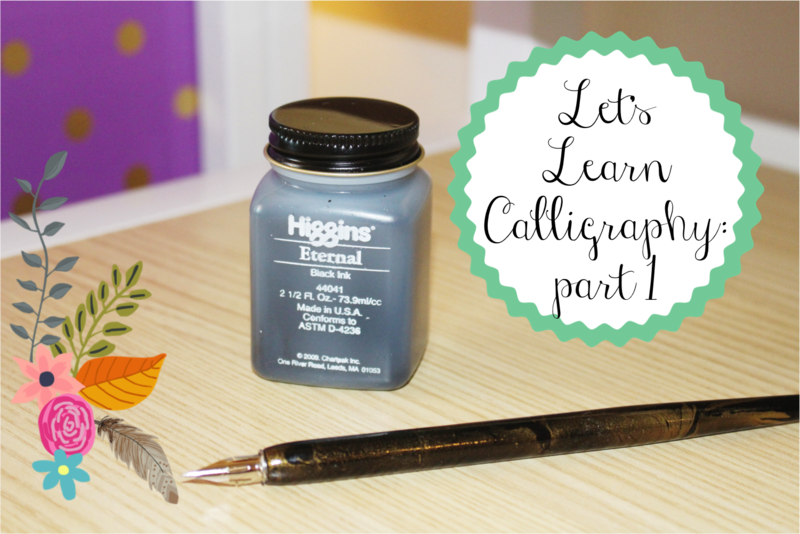 I am certainly no pro, I have been practicing and practicing and I am determined to successfully learn calligraphy at the end of this blog series. Instead of me "teaching" you (that makes no sense if I don't even know myself) I want you to learn with me! I have spent endless hours googling "how to's" and trying to find other blogs that have a series like this…I have come up a little shorthanded (except for this awesome blog). 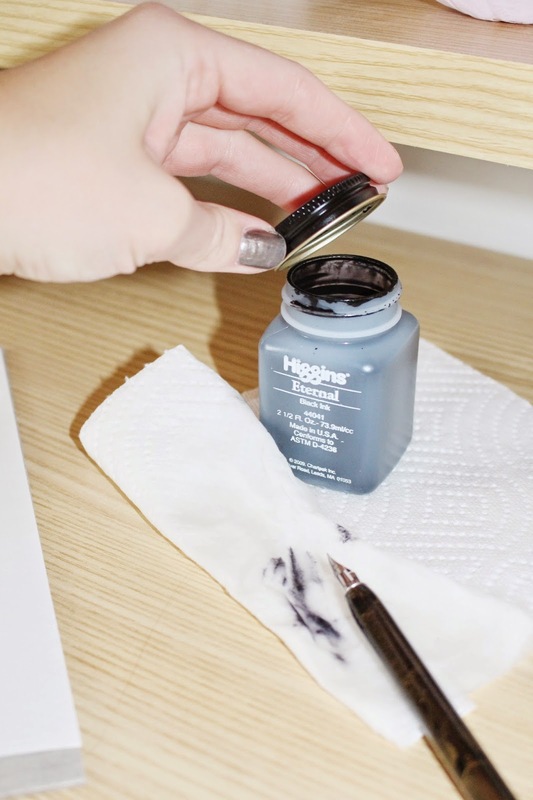 There aren't too many blogs, articles, how to's that go into specific detail about how to be a "super-fantastic" calligraphy writer so we are kind of wingin' this. I found all my materials on Paper & Ink Arts for a very, very reasonable price! My advice, start out simple. I went and first bought a "calligraphy kit" and was super overwhelmed so I returned it and went the simpler route. 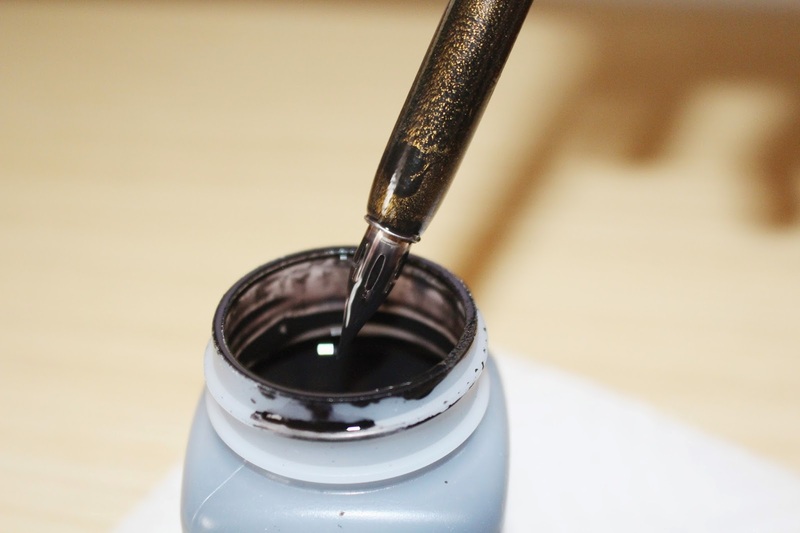 The first thing you need to do is place the nib in your pen holder and dip the pen in ink. You only need enough ink to fill the hole in the nib. 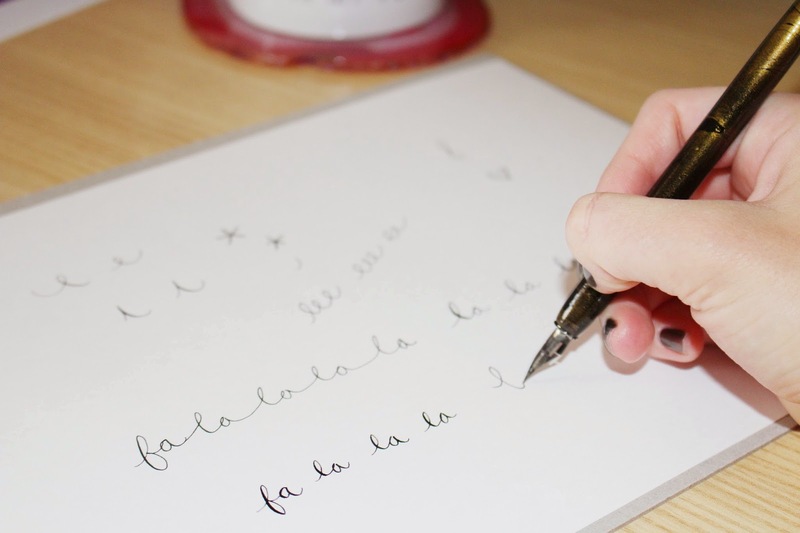 Now, simply practice writing and doodling with your calligraphy pen to get a feel for the pen. 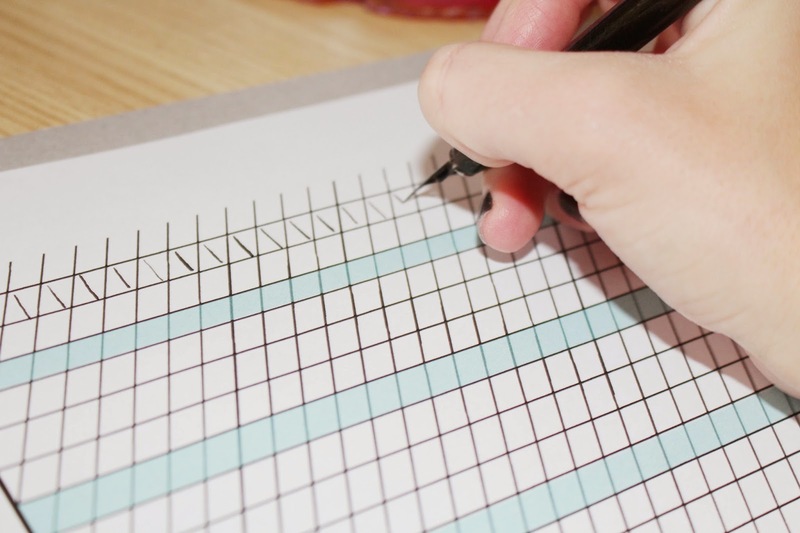 Now, pull out your grid designed by a wonderful calligrapher Madi Sanders. This grid will help you get a feel for the size of letters. First, practice making lines with different pressures. **A Key To Calligraphy Success: Use minimal to no pressure going UP and more pressure going down. See photo below for example. Now, practice writing your ABC's on your grid. The whole first part is getting a feel for the pen you are working with and the nib. If you hear a "scratching" noise try holding your pen a different way. 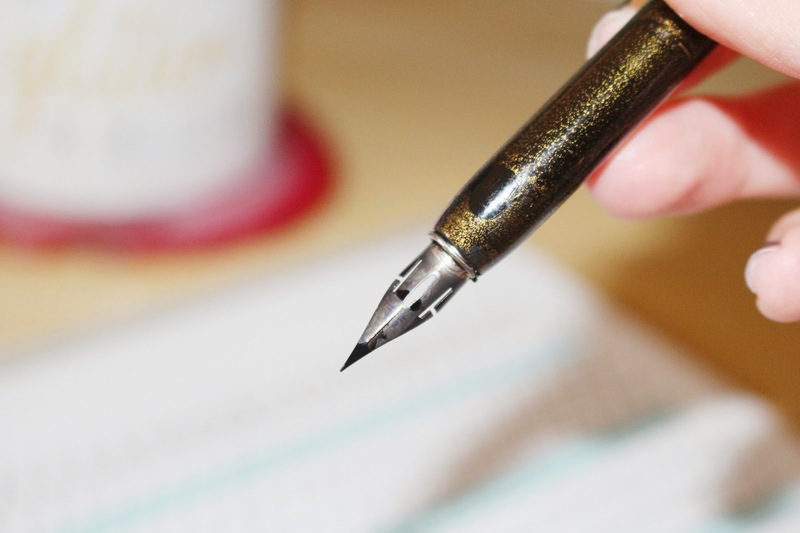 **Note: Your pen WILL run out of ink, you will notice this when the small hole in the nib is empty! You would have laughed so hard watching me trying to figure this stuff out for the first time. After you have completed the alphabet, keeping practicing! Try making your letters more curly, twisty. elegant, messy, smaller, larger, etc., etc. I am still working on all of my letters, it takes time to make them look like the pretty fonts you can download off the internet. Like I said, I'm still practicing. Ok, that's all for today! I am so excited about this new venture and hopefully after this someone can teach me how to use Photoshop…that's another story. As always, let me know if you have any tips or tricks!!! Holy cow! Where were when I got married!? You so could have practiced your work on my invitations haha! Have you thought about turning your calligraphy into a font once you are happy with it? That would have been so fun!! I haven't thought about that at all…but I am glad I have super smart blog friends because that is the best idea!! !